It's hard to believe it's taken this long to see a superheroine on network television but it's finally happened and it's good. CBS's 'Supergirl' comes from Greg Berlanti who's helped bring the golden age of comic book television with Arrow and The Flash on the CW. However, there isn't a more important or ambitious venture than bringing Superman's cousin to the ratings network leader. Luckily, Melissa Benoist handles it all with class, passion and enthusiasm. Sure, we've had Wonder Woman and Bionic Woman (both in the 1970s) and Jessica Jones doesn't arrive until November but when it comes to empowering television female action heroes the gold standards have been Buffy the Vampire Slayer and Xena: Warrior Princess (both ended in the early aughts). Since then there's been a resurgence of superhero shows and movies. The biggest movies have been Christopher Nolan's Dark Knight Trilogy and of course the Marvel Studios films. Except there hasn't been a solo film with a female lead to come from all that success. There won't be one until Wonder Woman (2017) and Captain Marvel (2018) arrive in theaters years from now. Black Widow has been especially popular from appearing in several of the films, but Marvel refuses to make a stand-alone film for her. They barely want to market toys and merchandise of her much less produce a movie. And while great female characters populate current TV shows they are part of a team or supporting characters. So fairly or unfairly, 'Supergirl' carries the burden of being the first in this new hero age to represent superheroines and its success (or not) will be scrutinized. The pilot jams a lot of information in one episode. It feels as though everything was riding on the pilot so they crammed it with backstory, present day slice-of-life, learning how to use her powers and showdown with a villain. That's a lot to take in and process, but Benoist aptly tackles the range of emotions with ease making a protagonist that is optimistic, resilient and empowering. As Kara Danvers aka Kara Zor-El, Benoist charms in ways Christopher Reeves did in 1978's Superman: The Movie. She's earnest and energetic with a great sense right and wrong. Twelve-year-old Kara escaped the doomed planet Krypton with her parents’ help at the same time as the infant Kal-El. Protected and raised on Earth by her foster family, the Danvers (Dean Cain and Helen Slater who've played Superman and Supergirl respectively themselves), Kara grew up in the shadow of her foster sister, Alex, and learned to conceal the phenomenal powers she shares with her famous cousin in order to keep her identity a secret. Years later at 24, Kara lives in National City assisting media mogul Cat Grant (Calista Flockhart doing her very best Devil Wears Prada Meryl Streep) and befriends top photographer Jimmy James Olsen (the hottest portrayal ever by Mehcad Brooks). The show wears its feminist spirit on its sleeve. The discussions of glass ceilings and proving she can stand on her own away from the humongous shadow of her better-known cousin are peppered in the script. It's a welcomed approach that doesn't avoid the topic even when facing an openly sexist alien villain in Vartox (Owain Yeoman). And this is where the show's ambitions take flight, literally. Berlanti could have taken on any superhero in the DC Comics catalog, but he chose one of the most powerful. A character in the Superman family takes a lot of visual effects and stunts and much grander in scale than a guy with a bow and arrow. And yet the third act in the pilot establishes 'Supergirl' as the action show you'd expect from a comic book adaptation, with all the impressive flying and fighting usually seen on the big screen. 'Supergirl' may be a lot of things, but it's not taking a backseat to any other superhero show on TV. Again, none of it works without a convincing lead and Benoist brings infectious enthusiasm and charm to Kara. She's excited about using her powers to help people and is invigorated when she saves a plane from crashing. This is the type of hero fans claim they want to see, not the brooding kind we get a steady diet of. 'Supergirl' shares more with 'The Flash' on the CW and 1978's 'Superman' than 'Gotham' or even Berlanti's other show 'Arrow.' 'Supergirl' is a winner, it's smart, it's fun and exciting. It's girl power at its finest. 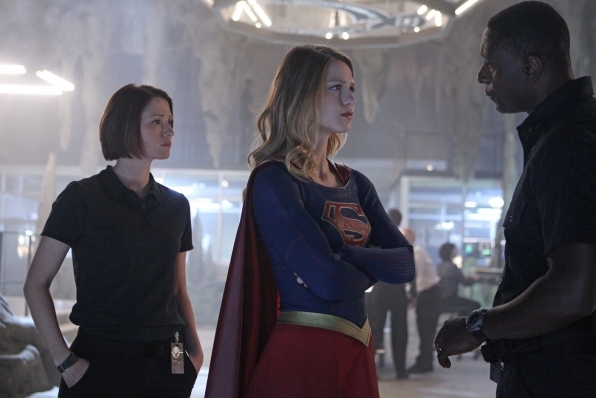 Supergirl's premiere airs Monday, October 26 at 8:30 PM. The series will then move to its regular Monday 8 PM slot the following week, November 2. Need more convincing or want more information? Check out these newly released sneak peeks of the show and a primer about the history of Supergirl below.